Two of our Junction Merchants, Hotwire Online Coffeehouse and EQ Fitness, will be a part of PARK(ing) Day, where parking lots are turned into a park for a day, to increase awareness on creating a walkable, livable and healthy city. Check out more details from SDOT below. 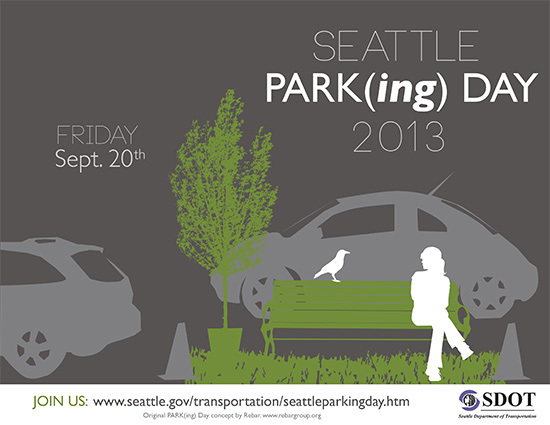 Come experience PARK(ing) Day on September 20, 2013 from 9:00 a.m. to 3:00 p.m.! PARK(ing) Day happens once a year, on the third Friday in September, and is an opportunity for any Seattleite to temporarily make parking spaces into parks. The event raises awareness about important issues like creating a walkable, livable, healthy city. The original PARK(ing) Day concept was developed by Rebar in San Francisco and has grown into a global movement with close to 1,000 parks in more 35 countries in 2012.This year, SDOT approved applications for 45 parks around the city, each offering a fun and unique way to engage with the local community. Check out the map below or this link for mobile devices to find PARK(ing) Day installations in your neighborhood.